educational was? The part in which you actually learn something. Mafia? That has got to be the tipping point of stupidity. collapse. With a certain degree of relief and disappointment, I’ve observed that the Universe is still here, minding its own business, watching us kill each other with a glass of martini. I don’t know which is worse though, the Universe’s indifference or watching “Ice road truckers”…. Dress- nowistyle, hat-random store, scarf- H&M, cardi- Asos. Awww you look so great! In every post, you look so great! Phhht, you want to talk about a channel that REALLY went downhill, lets talk about TLC! Remember when they use to be called The Learning Channel? (Oh, wait, they still are! Only now instead of showing documentaries and stuff, they teach us to crave ridiculously expensive bridal dress because that will be the only day of our lives that will matter and that we must all act like hillbillies. Well played Learning Channel, well played.) I know, I'm bitter but I've noticed the same thing happening to the history channel, I'm not too sure about show revolving around Aliens being "history" or whatever. I don't know, I just really like my documentaries. That goodness National Geographic hasn't gone down hill yet but History channel does have that delightful Vikings show on. I love me some Vikings. Hah, I will mention that I like watching Ice Road Truckers. It's like hey, I know that dude. It's the same way with the Alaska state Troppers show, everyone in Alaska watches that because we're sure that at some point in time, we'll see people we know being arrested. It's our very own version of "Cops." 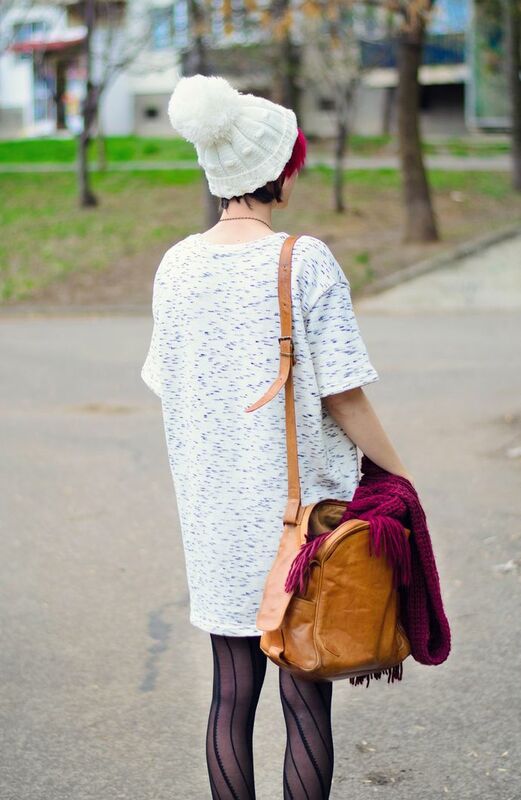 Love your t-shirt dress, it's perfectly casual and cute! omg fell in love with your style and pink hair!! Hahaha, ice road truckers. And there is that TV show about a man and his son and his son's son who are all into buying and selling old stuff business. I hate those fat creepers. As far as I know, History channel is only interested in who Hitler actually was. I totally miss that about the History Channel, too. I miss the real documentaries and stuff, not all this el chubacabra sighting theory crap. I want to learn about Egypt and the fall of the Roman Empire, god dammit! I really like that necklace and all your winter accessories here. You look super warm in that scarf and hat. This outfit is actually ridiculously appropriate because it is snowing here right now. I still need the chunky scarves and hats! Love your t-shirt dress! Looks great paired with some striped tights. And I forgot to say-I TOTALLY AGREE WITH YOU about the history and discovery channels. They weren't popular enough so they had to try to dumb it down for the masses or something? Augh, beats me. Love this outfit! Perfectly styled! but your outfit! it looks SO super cosy and warm, totally something I would need right now. that dress goes perfectly with your beanie and the burgundy scarf is awesome too. Girl, your look is top notch. LOVE IT. Питам се същия въпрос относно Discovery и History… обожавах предаванията за древните култури… египтяни, индианци, маи, будисти, елини и т.н. и също от онези готини предавания за някакви интересни неща като тунелите под Вашингтон, пътят на парите, странни съвпадения, интересни сгради и какво ли още не! I get what you're saying. The same thing happened with TV channels here in Nigeria. You are definitely not a grandma for liking those educational programs! Its such a shame that there are less and less of them every day, and more Jersey Shore. However, I do have to recommend the newest series from the BBC Africa called BBC One (http://www.bbc.co.uk/programmes/p010jc6p/episodes/guide) it's so good, it's scary good! Did I mention it was good? Not only is the content amazing, but the way it was shot is incredible (took 4 years to film 6 episodes). Okay my rambling stops here, but seriously, check it out! Seriously, dearie, only you could wear that hat and somehow still make it look badass.